McDonald High football coach Dan Williams knows that the safe route would have been to keep things as they were. After all, if it ain’t broke don’t fix it. Yet despite the fact that the Blue Devils offense had enjoyed decades-long success while running out of the Wing-T formation, the decision was made in the off-season to transition into a spread attack. The move was viewed by some as particularly interesting — and risky — given the fact that McDonald returned virtually its entire offense from a year ago. The group averaged 38.2 points per game in 2017, and they did so with a punishing ground attack. Then-junior Alex Cintron rushed for 1,466 yards and had 215 receiving yards while scoring 23 touchdowns. Fellow junior Josh Celli ran for 1,140 yards and 16 touchdowns. Still, Williams felt as though his system was in a bit of a rut. “We started kicking around the idea in the winter, we just felt like we were handcuffed at times when bigger defenses would load up nine or 10 in the box,” Williams said. “At first, some of the staff was reluctant, others were all in. But the more we weighed things, it seemed like the right thing to do and everyone was on board. Indeed, the Blue Devils have not missed a beat with their newfangled style of play. Through three games, McDonald (3-0) is averaging 48.6 points and 500 yards of offense. McDonald opened the season with a 48-14 win over Brookfield. A 42-35 victory over Columbiana avenged last year’s overtime loss to the Clippers. Last week, the Blue Devils rolled over Champion 56-7. 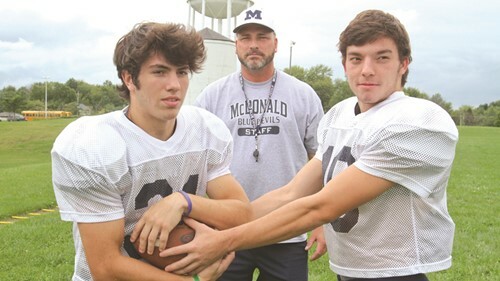 And, while the offensive formations may look completely different than they did in past years, McDonald is still getting results almost exclusively through its running game. Those 1,500 yards of offense through three games? Well, 1,239 of them have come on the ground. The Blue Devils are averaging 413 rushing yards to just 87 passing yards per game. As a team, McDonald is averaging an astounding 10.3 yards per rush. Cintron has carried the ball 62 times for 587 yards (9.5 yards per carry) with 10 touchdowns. Celli is averaging 10.6 yards per carry, with 454 yards and five touchdowns on 43 rushing attempts. Celli, who played the fullback position a year ago, is now the quarterback. He has completed 13 of 22 passes (four touchdowns) for 260 yards. Celli is playing the quarterback position for the first time in his career. “I was a little nervous when they first threw this idea by me, but my teammates really had my back and gave me a lot of confidence,” Celli said. “Honestly, I’m still learning the position. The offense is a lot more complicated, there’s a lot more options than when we ran the Wing-T. The biggest thing is reading the defenses and making quick decisions. To help orchestrate the offensive change, Williams and some of his staff attended a coaches clinic at the University of Cincinnati. The Bearcats are guided by former Ohio State coach Luke Fickell. Among the instructors at the clinic was former Springfield coach Doug Phillips, who is now the running backs coach for the Bearcats. “It was a great learning experience, you pick up so much about what exactly can be done [in the spread] based on personnel,” Williams said. “I think we came back from Cincinnati really confident that we were going in the right direction. Williams said that even though Celli is inexperienced at the quarterback position, his football intelligence, athleticism and leadership qualities helped for a smooth transition. Like Celli, Williams was also quick to give praise to his offensive line. Senior center Nate Dean admits that he was “extremely shocked” when he first learned of the change in the Blue Devils’ offensive philosophy. In addition to adjusting his blocking schemes, Dean was also presented with the challenge of snapping to a quarterback in the shotgun formation — something he rarely did until this year. Getting wins, regardless of style, is all that matters, according to Cintron. While McDonald (15 playoff appearances) historically owns one of the best resumes among all area schools, it has not advanced to the playoffs since 2014. The current senior class has not experienced November football. Last year, McDonald lost to Columbiana by a point in overtime on a failed two-point conversion. It lost to Western Reserve by five points thanks to an 87-yard kickoff return with 10 seconds remaining in the contest. The Devils finished 10th in the Division VI, Region 21 computer rankings, one point behind eighth-place Columbiana. “I was a ball boy the last time we were in the playoffs,” Cintron said. “The entire offseason, all we talked about was the pride and the history of this program. Us seniors have one more chance to make our mark and add to that history. We have to keep getting better each week. As for the future of the spread offense in McDonald? Well, it looks as though it may be here to stay. Williams said that even before he committed to the spread, he studied the junior high program to make sure it had athletes capable of running the system. For now, the new style of offensive football has claimed another victim for fans of old-style football. And with the same successful results. McDonald will look to push its record to 4-0 tonight when it hosts Waterloo.